0.1mm, KZ-B31 can be routed through narrow slit between body and cover case. extender by proven design techniques. 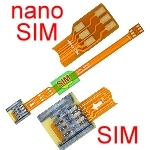 Click the button below to add the B3114A (Nano SIM to SIM Card Extender) to your wish list.